Out with the old. University officials, including Dean John Barr, center, display an architect's rendering of Leverone Hall, the new home of the School of Management. But first, the wrecking ball must finish off Memorial Hall (the Little Red Schoolhouse), behind them, in 1970. Lincoln came from Illinois, as did Walt Disney and Benny Goodman, for that matter. So it could be done, a person or institution rising up from the cornfields to national prominence. Not everything big, bold and dynamic had to come from somewhere else or have an Ivy League pedigree. That much was obvious. That much the University of Chicago had been proving, to the detriment of Northwestern University's School of Business which, in the early 1970s, found itself trailing a distant second in the Second City. "We couldn't even see the University of Chicago's dust, let alone eat it," says Pete Henderson, recalling the early days of his tenure as associate dean of administration at Northwestern's business school from 1971 until 1981. However, this situation would gradually and markedly change, exceeding Henderson's modest expectations that Northwestern could be merely "more competitive" with Chicago - "be the Avis to their Hertz," as he says. Indeed, even then the school had begun improving, cracking the top 15 on some lists as the decade progressed. In 1981, The Wall Street Journal took notice in a flattering feature that highlighted the school's "eclectic curriculum and ties to [the] 'real world.'" Most of Henderson's career at the university occurred before the "Kellogg" brand emerged, but thanks to strategic moves by two deans, John Barr and Donald P. Jacobs, and the school's overall mission realignment, begun in 1965, the institution would gain fame. Its young, research-based faculty, innovative culture and collaborative learning model would all represent a fresh approach not only at the school, but in business education. Then too, in June 1966 university trustees approved a bold decision to scrap an established undergraduate business curriculum and focus instead on graduate-level education. This event announced an overarching shift in the school's philosophy to emphasize lifelong learning as a critical tool for leaders grappling with an increasingly complex and technologically driven global economy. Another momentous change came in September 1969, when the school discarded the MBA degree and adopted the "Master of Management" degree, a point of differentiation from peers and a move designed to illustrate the belief that management had far broader applications than just business. Attorney Dale Park Jr. proved key in securing a $10 million gift to name the Kellogg School of Management. By 1979, the school hung on the cusp of greatness. Early that year, the air at Northwestern was charged with anticipation as administrators waited to learn whether the John L. and Helen Kellogg Foundation, looking to disburse about $40 million to deserving organizations, would send some of that money to the business school after considering a proposal put together chiefly by attorney Dale Park Jr.
"In those days, $40 million was a huge, huge amount of money," says Park, adding that the figure was comparable to the Wrigley estate. The stakes were significant. This Kellogg money would provide irrefutable proof that a prestigious external foundation had noted the innovations occurring at the school, especially since Jacobs became dean in 1975 and had launched a series of remarkable initiatives. Among these were efforts to enhance the school's international presence, bolster its faculty, and defy the critics to build an executive education facility - the James L. Allen Center - that soon attracted universal admiration. "We announced our belief that, given the rate of change in the world, education was not simply a degree-granting conclusion - get your MBA and then you are finished - but rather the beginning of a lifelong educational process," says Jacobs, dean for 26 years until stepping down in 2001 when Dipak C. Jain assumed the leadership. Jacobs' adroit fund raising - he generated about $4 million annually by 1979 and some $400 million total over his tenure - in conjunction with his uncanny ability to connect with business leaders, was key to these successes. "The fact of the matter is, I have no ego, so people accept me," explains Jacobs, the son of a Chicago baker. For a rigorous academic who since 1957 had served as a finance professor at Northwestern, Jacobs demonstrated great skill in bridging theory and practice, recognizing the importance of bringing the academy to the real world while listening carefully to practitioners' insights. The cutting-edge curriculum that he and his lean administration constantly refined in response to the market depended on this interplay of ideas. Capturing part of the Kellogg Foundation's $40 million could now radically alter the playing field for the school, providing resources to redouble its efforts - maybe even affording the chance to jump past a competitor and move a notch closer to the very top ranks. But this would require a concerted effort. Park was no stranger to important business figures: his father-in-law was James L. Allen, a co-founder of the venerable consultancy Booz Allen Hamilton and himself a Northwestern trustee and longtime member of the school's advisory council who, with Jacobs, spearheaded a $5.5 million capital campaign for the Allen Center. But Park did, and still does, identity himself as a lawyer, not a businessman. In fact, he landed on the Kellogg Foundation's board only after a colleague at his law firm introduced him to Helen Kellogg, whom Park went on to help resolve an important legal matter. 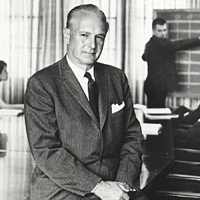 After Helen's death in 1978, Leonard Spacek, the renowned Arthur Andersen managing partner, became the foundation's president, working with a relatively small board whose members included W. Keith Kellogg II; Trans Union CEO and director Jerry Van Gorkom; Baxter CEO Vernon Loucks Jr.; and Dr. Vincent Dole, the Rockefeller University physician who discovered methadone as a treatment for opiate addiction. "And there was me," says Park, with a self-deprecating smile. After serving as attorney and board chairman for Montgomery Ward, John Barr became dean of the School of Commerce. 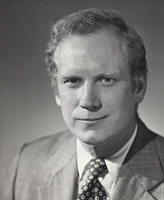 During his 1965-1975 tenure at Northwestern University, Barr leveraged his business connections to help the school develop a new focus that would prepare managers for leadership roles in a more complex world. "I was sort of in awe," he admits. "Leonard was something else - great ethics, so smart. After some of these meetings he would say to me, 'Dale, are you OK?' Well I was exhausted from trying to take notes so I could write the minutes! Leonard was so fast with ideas." Park says the board's decision to give away the Kellogg money was unanimous. The alternative, outlined by Spacek, was to continue the foundation for years, running up administrative bills. To avoid this and to place the funds in the best hands, each board member was to write a letter to Spacek proposing how the foundation should allocate its resources, recalls Park, who consulted with Jim Allen about the matter, telling his father-in-law, "I might be able to get you $1 million for the management school." Allen suggested Park talk with Henderson. "I had lunch with Pete and, as we were leaving, he said, 'If you give us $10 million we'll give you the name of the school,'" says Park. Park researched the origin of the Kellogg fortune back to 1834 and John Preston Kellogg, father of John Harvey Kellogg and Will K. Kellogg, the brothers who would, by accident, produce the first pre-cooked flaked cereal in 1894. This discovery would make the Kellogg family famous and connect them to the business world - a fact that Park would accent in an eight-page proposal to Spacek and the board. In this July 29, 1978, document, Park articulated the reasons why Northwestern deserved consideration. Behind his reasoning lay a belief in education's power. "If you want to multiply the effect of a grant, I always thought you should give it to education," notes Park, "because you don't just benefit one person; you benefit a tremendous number of people." Henderson could find no flaw in this logic. A former Booz Allen Hamilton executive who came to Northwestern seeking a new career that offered the recent widower flexibility to raise his three young children, Henderson says he "tried to play every angle" to ensure the university received some Kellogg money. "I called Leonard Spacek at his home in Palm Springs," Henderson says. "I told him, 'We would love to come and see you. We think we've got a wonderful school here, one that would be an appropriate place for you to designate funds.'" This zeal hardly moved the famously circumspect accountant. "He told me, 'Let me describe the scene here, Mr. Henderson. There are 12 nuns in my backyard, five priests in the front yard. None of them has broken through my defenses. You too are welcome to come out and stand with those priests and nuns, Mr. Henderson, but neither will you get into my house." 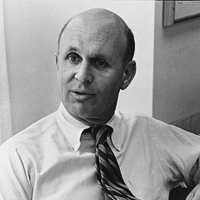 Former Associate Dean Pete Henderson helped enhance a variety of administrative elements during his 1971-1981 tenure, including student recruitment. It didn't take a religious conversion for Northwestern insiders to appreciate how far the business school had come. They knew that daring changes to its curriculum and scope, begun during the Barr era of 1965-1975, had then flowered under the entrepreneurial and visionary Jacobs deanship. But for those outside this community, the first real appreciation that an important new player now challenged the top management schools came in early 1979 with news that the Kellogg Foundation was indeed giving $10 million to Northwestern, creating the J.L. Kellogg School of Management. "We had an office pool in sealed envelopes wagering what we would receive from them," says Henderson. "The answers ranged from zero to $10 million. Don's [Jacobs] vote was $10 million; mine wasn't. I was not that hopeful." Jacobs says that a lot of people bet zero, but he felt optimistic about the school's chances, thanks to Park's efforts to articulate the administration's plan to bolster its academic reputation by establishing three major research centers, two endowed professorships in the area of nonprofit management and management policy, and four annual research professorships. In addition, several million was marked to renovate Evanston Apartments, a seven-story residence complex "in really bad shape," as it had housed 650 Northwestern undergraduates. Jacobs would turn the property into a "living-learning center" for graduate business students. "Dale was a very, very important person in the whole thing," says the Kellogg School's dean emeritus. "He has done more for Kellogg than almost anybody, and he won't take any credit. But he deserves a lot of credit." In a letter, dated March 12, 1979, Jacobs thanks Park "for having single-handedly brought about this milestone gift," and pledges his "continuing efforts to merit the confidence the gift implies." Jacobs wryly observes his own reaction to the news of the gift: "I told Leonard Spacek this was the worst day of my life. Leonard said, 'What are you talking about? We just gave you $10 million!' Yes, but for the rest of my life I'm not going to sleep at night, thinking I should have asked for more. I told them they should have given us nine-point-nine or nine-point-nine five - anything but the exact figure we requested," says Jacobs, laughing. "But Leonard was a straight shooter and he assured me they wouldn't have given us another dime." With the foundation's gift, one of the largest of its kind at the time, the stage was set for the Kellogg School's meteoric ascent into the top echelon of management leaders. But to understand the school's remarkable journey, it is important to note key changes that occurred during the Barr tenure, and what was destroyed in order to build. Next page: "An innovative and leadership position in management education"